As armor improved, swords were forced to change. This 12th Century Medieval Sword with Scabbard is an example of how they changed, developing into larger blades that excelled at slashing, crushing, and thrusting, all to negate a foes armor. This sword has an iconic cruciform design of similar type to what was favored during the early eras of the Crusades. The blade features a fuller designed to help reduce its weight, as well as a subtle profile taper that allows the blade to excel at slashing and hacking while still providing an effective point for piercing mail and slipping through armored plates. The blade is dual hardened and forged from 5160 high carbon steel. 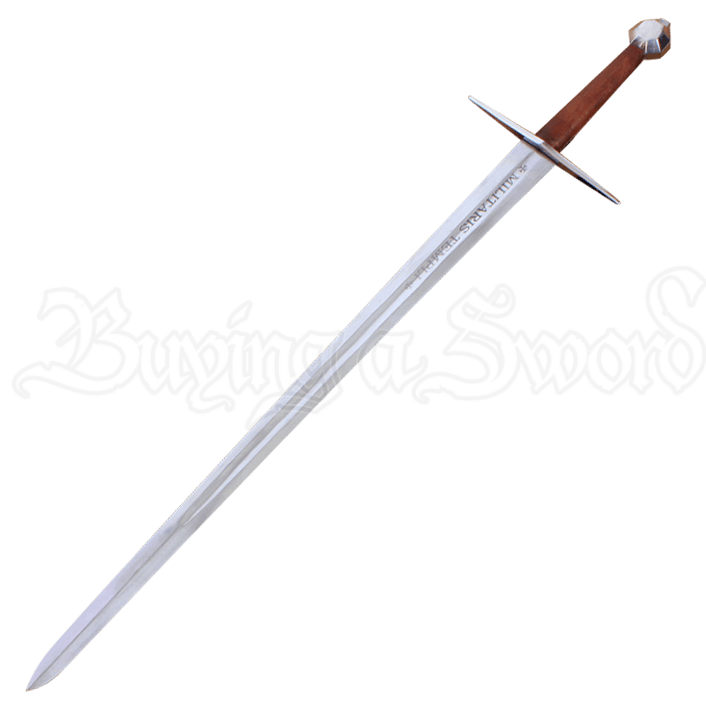 Etched into the blade are twin cross emblems, as well as the phrase Militaris Templi. The straight quillons of the crossguard are understated yet effective, while the long grip and the jewel-shaped pommel help provide proper weight distribution and grippage. The sword has a full-length tang which is peened at the pommel. The sword includes a matching leather wrapped wood scabbard, which is perfect for storing the sword when it is not in use. No sword belt is included, so freely attach the sword and scabbard to your own favorite sword belt. The leather on the scabbard is also stamped with a Templar emblem at the throat and a Templar cross along its length. Strong, sturdy, and powerful, this 12th Century Medieval Sword with Scabbard is an impressive example of how effective a big sword can be, especially once you handle this blade and realize that it is not only powerful, but responsive and quick, too.